I had just returned to my car at 10:00PM after celebrating picking a lab for my doctoral research and was thinking about the gear I would need for my first training with the team Saturday morning when I got the callout. It was for a German PCT hiker (Julian), who had activated his Garmin inReach device on Fuller Ridge. As this was my third mission and first rescue, I didn’t know how involved I would be with the rescue. However, I packed my gear and headed to Hemet with Blake where we would meet up with the rest of the team and drive up to the Marion Mountain trailhead on the still closed highway 74. After arriving at the trailhead and packing, we (Blake, Josh, Daniel, Shani and I) set out on the trail with Glenn at base at 1:30AM. 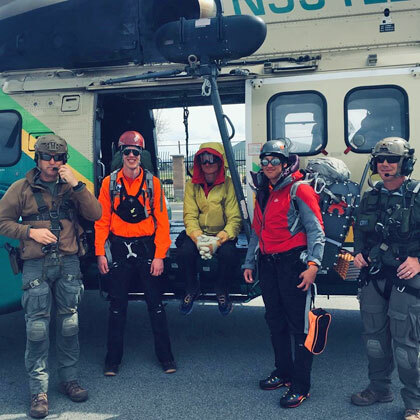 We were briefed that Julian no longer had his backpack, so it was important we reached him as it was below freezing, and air support was not available due to cloud cover. We followed the Marion Mountain trail up through the night, but due to increasing snow depth, following the path became difficult. From that point, we hiked through semi solid snow navigating by GPS to the PCT Marion Mountain Trail junction. This steep 2.8-mile hike is not easy in dry conditions and exhausting in snow. Upon reaching the junction (5:30AM), Blake, Josh and Daniel stayed put to rest and stand by in case Shani and I needed help. Shani and I then headed out on the PCT towards Fuller Ridge. Sunrise brought beautiful views of Gorgonio, Baldy and the Santa Anas above the clouds as we slowly hiked on. We initially tried to follow the trail, as we found tracks of what may have been Julian, but we left them for a better route across the west side of the ridge, close to where the trail would have been. As we hiked along the ridge, the terrain became steeper, and we neared a creek crossing. The deep snow made this crossing impossible, so I found a snow-covered log, probing with an ice axe as I crossed. We traversed the continually steepening ridge side, necessitating self-belaying with our ice axes. When we came to a section where we needed crampons, it was, of course, too steep to put them on, so we carefully continued kicking steps into the hard snow to a flat rock. We put on crampons and came to another creek and crossed via snow bridge. I led, again probing, and Shani crossed behind me. Shani probed after getting off and found a very thin area nearly where I had just stepped. Thankfully this was our last crossing. The crampons sped our traverse, which in some places was an exciting 40 degrees and over 30 degrees for half a mile. At one point we again crossed tracks, this time in the form of a slide rather than footsteps. This worried us that Julian may also be injured by the fall in addition to being without a pack. We finally reached the ridgetop (Fuller Ridge) and were met with less technical terrain, a welcome thing, but were also met with wind. Around this same time, Glenn radioed two good pieces of news, Star-9 was on its way to search and Julian had recently sent out a message. This indicated to us he was still alive. 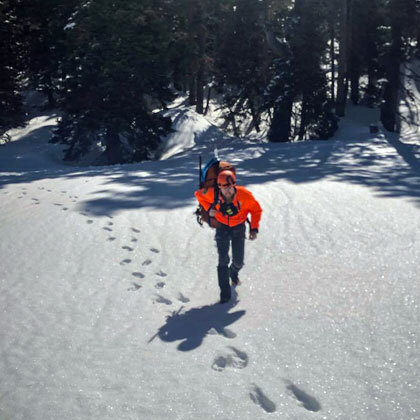 We began to call out about ½ mile from the Garmin inReach GPS point, but the wind made the chance of hearing a reply nearly impossible. Star-9 began circling overhead but was not able to spot Julian. Shani and I spread out (keeping visual contact) to maximize the chance of hearing a response to our calls, and I made visual contact with Julian around 9:30AM. I made voice contact confirming it was Julian. He was excited to see us after spending a long, dark, cold night, but he was cold. Thankfully, he was visibly shivering, indicating he had not slipped too far into hypothermia. After asking about any major injuries, a fear we had from seeing his sliding tracks, and receiving a reply in the negative, I gave him food, water and an extra jacket while Shani radioed the good news to base. Julian had lost his backpack after setting it down to look for a campsite the night before, losing all food, water and clothing. He had activated his beacon when it became too dark to search for his pack and then made two beneficial decisions: 1) Stay where he activated the beacon, 2) Stay active all night to keep warm enough. Shani and I were both thankful for this as we were tired after our technical night hike; we were prepared to begin searching, but glad we did not have to. At this point, we hoped for a quick hoist, but Star-9 was unable to find a good position due to the wind. We got word that LA Air Rescue 5 was available and could perform the hoist in an hour. 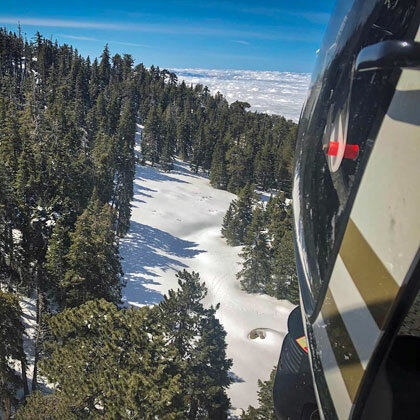 Photo by Riverside Sheriff's Aviation. At this time Riverside Sheriff’s Aviation was able to pick up the other team members by landing in a meadow and flying them back to Keenwild base. We moved to a more sheltered location and Shani made tea for Julian as well as checked for frostbite. In an hour we heard that LA Air Rescue 5 would be to our location in one more hour and during this time, Shani and I looked for alternative hoisting spots while the subject warmed in my sleeping bag. Additionally, this was my first hoist, so Shani explained what I would need to be aware of. Upon arrival LA Air Rescue 5 lowered their medic and I was first to be hoisted. Shani was next up and then Julian and the medic together. We had a quick flight to Hemet-Ryan Airport, and after Julian was taken to a local hotel by a deputy, Shani and I napped in the comfort of the hanger. After standing by at the trail junction for much of the duration of the mission, Blake, Daniel and Josh were flown to Keenwild by Star-9. Photo by Air 5 Crew Member. I want to especially thank LA Air Rescue 5 for their expert flying, Riverside Sheriff’s Aviation, and Shani for guiding me on my first rescue mission. RMRU Members Involved: Blake Douglas, James Echkardt, Josh Gould, Glenn Henderson, Shani Pynn, and Daniel Tran.